Snipes, who resigned after receiving intense scrutiny for her office's handling of the midterm elections earlier this month, is already receiving $58,560 in state pensions from her earlier career as an educator, and is set to add almost $71,000 a year for her time in elected office, the Sun Sentinel reported Tuesday. [Florida TaxWatch CEO Dominic] Calabro said Snipes will also benefit from annual cost-of-living increases, averaging between 2 percent and 3 percent, that will add thousands of dollars to her pensions each year. Calabro, whose organization is a nonprofit, nonpartisan government watchdog group, said Snipes' pension pay "really raises the question, on top of everything else, why she's being excessively compensated for doing a poor job. That's the added insult to injury." "It just leaves additional salt in the wound," he added. The average annual pension for elected officials in Florida's state retirement plan in 2017 was $53,223, the Sentinel noted. 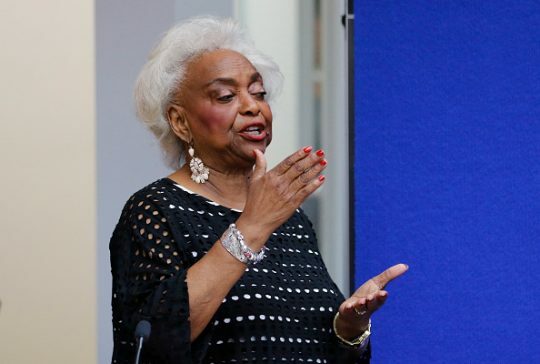 Snipes became the subject of national scrutiny after a series of mishaps concerning the recount of the Senate race between incumbent Democratic Sen. Bill Nelson (Fla.) and his Republican challenger, current Florida Gov. Rick Scott, who eventually was declared the winner. Broward County failed to submit the results of the recount by the state's deadline; lost thousands of ballots that were initially counted but did not make it to the recount; and her office, according to the Sentinel, opened 205 provisional early-voting ballots before Broward's Canvassing Board determined their validity. Snipes—who was also found to have destroyed ballots earlier than allowed in a previous election and regularly lost absentee ballots, among other issues—submitted her resignation last week. "Although I have enjoyed this work tremendously over these many election cycles, both large and small, I am ready to pass the torch," Snipes wrote in her resignation letter to Scott. "Therefore, I request that you accept my letter of resignation effective January 4, 2019."